Reston architectural aficionados know that Reston architect Ken Bonner built the first house in Reston — a detached single-family house on Stirrup Road in South Reston. In a Fairfax Times article, Bonner recalled having to transport a portable generator to the building site because there were no power lines yet. This was back in 1964. Integrating a human living space into nature in an environmentally sensitive way was Bonner’s passion, and a trademark of any Bonner home is using natural sunlight and preserving trees. Ken built about 65 homes, including my first home in Reston on Buttermilk Lane in the Uplands neighborhood. It backed up to beautiful, treed lot with a creek at the bottom of the backyard. It was a fantastic place to raise our family. 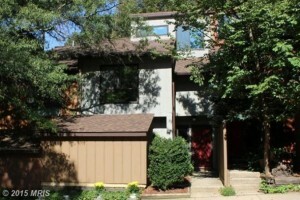 Built in 1972-1973, these contemporary townhomes are three levels with cedar siding exteriors. The 1,600 to 2,000 square feet homes feel much larger because of Ken’s attention to every detail. These lovely homes are not only perfect for anyone looking for well-designed, contemporary architecture in a close-knit, townhome community; they represent a piece of what makes Reston such a great place to live.